The Civil War has accumulated several references over the years—“The Great Rebellion,” “War Between the States,” and “War for Southern Independence,” to name a few. One reference that is practically true to Gettysburg is “The Brothers’ War.” There are countless Civil War stories of brothers fighting alongside one another in battle, and some even on opposite sides. These three hit close to home. Years later, Levi slipped and broke his cork leg on his wedding day, leaving him unable to stand for the ceremony. Luckily, his brother came to the rescue and lent him his own cork leg so Levi could stand up on his big day. This could very well be the only time on record where one man was married while standing on the leg of another! Isaac was born in 1837 and his brother Patrick closely followed in 1838. Both brothers attended college in Illinois to become teachers. They enlisted to fight in the war and served in the 1st Minnesota. Isaac kept a detailed diary throughout the war, which became a primary source for regimental historian Richard Moe. During the Battle of Gettysburg, the fighting of the Taylor brothers’ regiment is legendary. The men offered a sacrificial charge resulting in an 82-percent loss of men within 15 minutes of combat. Identical twins George and Thomas Dennen both served in the New York City fire department and, with many of their colleagues, enlisted in the 73rd New York Fire Zouaves in 1861. The two brothers were not only identical physically; they also embodied the same walk, gestures, tone of voice, and unique laugh. They were great counterparts, officers, and friends. They often used their unique likeness of one another to play jokes and tricks on fellow soldiers. 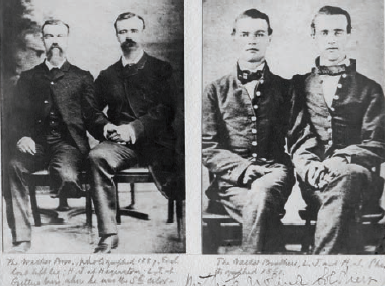 The brothers fought together until Thomas was struck with a head wound during the Seven Days Battles in 1862. He rejoined his brother several months later, for the spring campaign of 1863. At Chancellorsville, Thomas was struck again by enemy fire and died on the field. George dropped to his knees and wept over his dead brother. He was so distraught that the company Sergeant remarked that he could never forget the sight of the grief-stricken George. After that, George was never the same—he was often seen weeping in his tent clutching his twin’s photograph. When comrades tried to console him by commenting how handsome he looked in his officer’s uniform, he replied, “I shall not wear it long; I shall follow Tom and be killed in the next battle.” He repeated this sentiment on a daily basis during the march to Gettysburg, where he died as a result of wounds suffered in the Peach Orchard. From sharing a leg and a laugh to a diary and death, these stories remind us of the human sacrifice of war—and the unbreakable bond of brotherhood.